Home » Health » What Is Corneal Ulcer? Corneal ulcer is an open wound to the cornea that is most often caused by infection. This condition is classified as a medical emergency, which can lead to blindness if not treated immediately. The cornea is a clear membrane located in front of the eye. This organ has several functions, one of which is refracting the light that enters the eye. Therefore, the cornea determines the eye's focus on the object being seen. In addition, the cornea also serves to protect the eyes from dirt and germs that can damage the eyes. If the cornea is damaged by infection or injury, its function will be impaired and affect vision. Symptoms of a corneal ulcer are white spots on the cornea. White spots can be easily seen if the size of the wound is large enough. Please note, the corneal ulcer is very dangerous and must be treated immediately to prevent blindness. Feels like something in the eye. The eyes are very painful. Corneal ulcers are most often caused by viral, bacterial, fungal, or parasitic infections, as will be explained below. Corneal ulcers can be caused by infection with the herpes simplex virus in the eye. 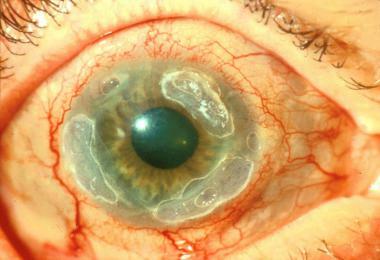 This infection can be triggered by stress, weakening the immune system, or exposure to the sun to the eye for too long. In addition to herpes simplex, corneal ulcers can also be caused by the varicella virus. Corneal ulcers due to bacterial infections generally occur in someone who wears contact lenses for a long time. The use of contact lenses that are too long makes the cornea not get enough oxygen, making it vulnerable to infection. Bacteria can grow on contact lenses that are not cleaned properly. These bacteria can develop and trigger ulcers, if contaminated contact lenses were used for a long time. Corneal ulcers caused by fungal infections are classified as rare. Fungal infections of the cornea generally occur when the eye is exposed to organic material, such as plucked plant branches. Corneal ulcers due to parasitic infections are most often caused by Acanthamoeba , a type of amoeba that lives in water and soil. Injuries to the cornea caused by something, such as sand, broken glass, makeup, or exposed nail pieces when cutting nails. To diagnose a corneal ulcer, an ophthalmologist will use a special microscope for the eye or slit lamp . To make the ulcer more visible, the doctor will give special eye drops ( fluorescence ) to the patient's eyes. If the doctor suspects the corneal ulcer in the patient is caused by an infection, the doctor will do the culture (corneal sampling) to be examined in the laboratory. By knowing the type of germs that cause infection, appropriate treatment can be given. To treat a corneal ulcer, the doctor will prescribe antiviral drugs, antibiotics, or antifungals . The choice of the drug depends on the underlying cause. Especially for corneal ulcers caused by bacterial infections, the patient's eyes will not be closed so as not to provide conditions suitable for bacterial growth. In a corneal ulcer whose cause is unknown, the doctor will give antibiotic eye drops. If the area of ​​the cornea that is infected is wide enough, give one drop of antibiotics to the eye every one hour. Whereas if the eyes are inflamed or swollen, the doctor will give corticosteroid eye drops. Special eye drops will also be given to keep the pupils widening. During the treatment period, patients are prohibited from wearing contact lenses, using makeup for the eyes, and touching or rubbing their eyes with unclean hands. The doctor will also ask patients to take painkillers, such as paracetamol or ibuprofen. In addition, it is advisable to wear protective goggles, and limit the spread of infections by routinely washing hands and drying them with a clean towel. In the case of a very severe corneal ulcer, the doctor will recommend a keratoplasty or corneal transplant. Keratoplasty is a procedure to replace the cornea of ​​a patient with a healthy cornea from a donor. Patients will be advised to undergo a routine examination after keratoplasty, until the doctor states the patient has fully recovered. Corneal ulcer includes a medical emergency. If left unchecked, the ulcer can spread throughout the eyes, and can result in partial or total blindness in a short time. Therefore, immediately see a doctor if symptoms appear, such as pain in the eyes, deteriorating vision, or discharge from the eyes. Corneal ulcers can be prevented by immediately seeking medical attention if there are symptoms of an eye infection, or if there is an injury to the eye. It is recommended to wear protective goggles, when carrying out activities that are at risk of injuring the eyes or causing flicker. In patients with dry eye syndrome or eyelids that do not close completely, artificial tears can be used to keep the eyes lubricated. For those of you who wear contact lenses, use and clean contact lenses according to the instructions for use. Always wash your hands before touching the lens. Don't use saliva to clean the lens, because saliva contains bacteria that can injure the cornea. Always remove contact lenses before going to bed. Remove contact lenses if eye irritation occurs, and do not wear before the eyes heal. Always clean contact lenses before and after use. Don't use tap water to clean contact lenses. Replace the lens at the time recommended by the doctor. 0 Response to "What Is Corneal Ulcer?"